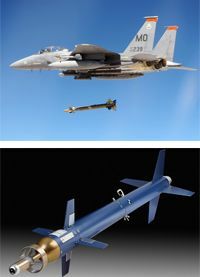 At SyntecOptics.com, we provide defense optics for missile systems. From optical and opaque components to optoelctronics subassemblies we offer the most suitable solutions for your application. Missile systems are an integral part of air defense systems. Syntec Optics was commissioned to create the optical and opaque components to be used in an optoelectronic sub-assembly for a defense industry client. The sub-assembly was to be used for guidance systems to provide US Homeland Security. This tactical optics included 16 components, both optical and opaque, that needed to be brought to production very quickly. By utilizing our Design For Manufacture (DFM) concepts to optimize the part geometries, then we engineered mold tooling and inspection fixturing. The optical and most opaque components were injection molded using our Arburg 28-ton injection molding machines. Many Larger opaque components were injection molded using our Toshiba 170-ton injection molding machine. The optical components were made from various material resins including Polyetherimide Ultem 1000 and Polycarbonate Lexan 121. The opaque components were made using various material resins including Nylon 6/6 and Polycarbonate Lexan. The subassembly had several components, and we worked within extremely tight tolerances during the manufacturing process. Following production, we performed profilometer and Coordinate Measuring Machine (CMM) data computation. With final approval through the Quality Assurance Department, we then quickly shipped the product to the client, who was very pleased with the success of each individual component used to make the optoelectronic sub-assembly. The 16 components were completely brought to production in 6 months through the resources and teamwork of Syntec personnel.